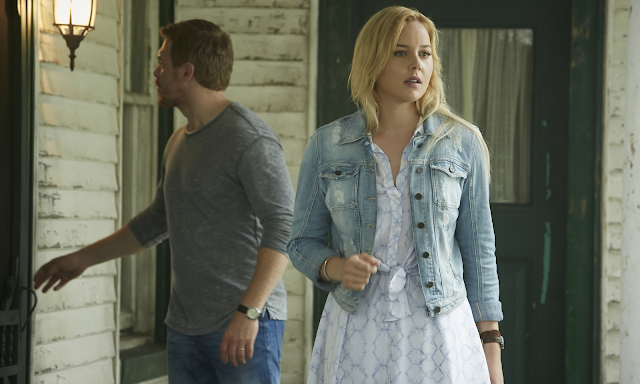 Abbie Cornish and Diego Klattenhoff star in Lavender. Writer/director Ed Gass-Donnelly returns with another tale of small town murder songs in Lavender. The lullaby that haunts this film is the nursery rhyme “Lavender’s Blue.” It might be a childhood staple, but these rhyming lines of “dilly dilly” have long roots in horror that help add an extra chill to Lavender. Whether they appear in operatic adaptations of The Turn of the Screw, repeat themselves in Brad Fraser’s play Unidentified Human Remains and the Nature of True Love, or are sung consolingly in the latest take on Cinderella, this kiddy ballad isn’t exactly soothing. It’s downright eerie, especially when used as a haunting refrain. The verses of “Lavender’s Blue” echo throughout Lavender as Jane (Abbie Cornish) sleepwalks through traumatic memories of her childhood. The song evokes soothing reminders of her sister and parents, but it turns into a hypnotic chant as Jane recalls images of the brutal murder that left her family dead and put her at the centre of an unresolved mystery. The past comes back to terrify Jane when a freak car accident unscrambles her brain and loosens dormant memories. She starts seeing things. Gifts appear. News of an inherited house—a place she doesn’t even remember but to which she feels a pull whenever she passes a golden field—brings her home and puts her back at the scene of the crime. This homecoming reunites her with an estranged uncle (Dermot Mulroney, creepy in a small role) and forces her to confront the ghosts of her past (literally) to ensure that she doesn’t lose another family. This situation puts Jane’s husband Alan (Diego Klattenhoff) and daughter Alice (Lola Flanery) in peril, but Lavender is most successful at delivering intense horror when it turns its attention to the ghosts that chill Jane to her core. A memorable shot, say, of Abbie Cornish staring vacantly at all painting, all shaken and perplexed in direct, pleading eye contact with the camera, is far more startling than the few pop out surprises or obligatory music cues are. The film is an unnerving character study about the trauma with which survivors of abuse experience day by day and the demons they encounter when unsuspected encounters trigger old wounds. Lavender’s recurrent use of the children’s song is especially disquieting in its constant reminder that the worst perpetrators of abuse against the young are often some of their closest guardians and most trusted elders. Lavender sometimes struggles with its icy pacing as shards of Jane’s discombobulated memory repeat and return. The repetitive bent to the film is more of a tease than an agent of suspense. The film is admittedly slow, and confidently so, but the strong final act redeems it. Gass-Donnelly and cinematographer Bendan Steacy use a cool lens to create a tense, foreboding atmosphere. The stark use of colour is frequently striking as vibrant red balloons and ribbony gifts pop out of the frame like alien intruders as Jane slips in and out of subjective experience. Lavender creates some otherworldly images through that use colour to infuse the gothic tension dots of childlike wonder. Abbie Cornish is extremely good as she navigates the web of Jane’s fragmented memories and trips outside present reality. Subdued and shaken, Cornish uses the survivor’s anxiety and confusion to her advantage as she invests the audience in Jane’s search for answers. The innocent inquisitiveness that gently pushes her to explore her past, moreover, makes the experience extra unnerving as Jane goes back to the root of her horror and slowly, painfully, relives the gruesome event with fearful hesitation. Lavender dillydallies, but the glacial pace can be downright chilling. Lavender opens in Ottawa (South Keys), Vancouver (The Park), Calgary (Eau Claire), Halifax (Park Lane), and Toronto (Yonge/Dundas, with Ed Gass-Donnelly and select cast at the Friday 7:00 PM screening). Lavender PNP trailer from Pacific Northwest Pictures on Vimeo.